Corrugated Cardboard: Is the most common use is in making packaging and shipping boxes. This cardboard is made of flat layers with Flutes ( wavy ) layers between. Single Face: Has one layer of flat board with a layer of fluted board. This makes it flexible. Common uses are wrapping items and protection of floors during construction. It comes in rolls form. Rolls out and then up to reuse. Single Wall: Is made from a layer of flat board, fluted board and another layer of flat. C flute is the most common used in making of boxes. The smaller fluted materials govern the the strength and quality of printing surface. Most packing boxes have a round circle printed on them. Inside that circle it has the information on the ratings and materials used. There are several grades that are commonly referred to as Edge Crush Test ( 32ECT ) and Pounds Per Square Inch ( 200# ). 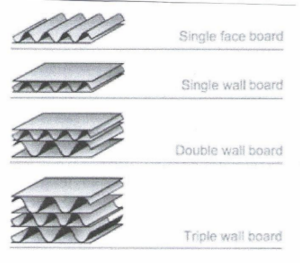 Multiple Wall: By counting the layers of flutes, not the flat layers of board, you can determine whether it is single, double or triple wall cardboard. Combining the different type of flutes determine the strength and thickness of the board. Triple wall cardboard is commonly used when the weight of plywood is not wanted.